A temperature window for the synthesis of single-walled carbon nanotubes by catalytic chemical vapor deposition of CH4over Mo2-Fe10/MgO catalyst has been studied by Raman spectroscopy. The results showed that when the temperature is lower than 750 °C, there were few SWCNTs formed, and when the temperature is higher than 950 °C, mass amorphous carbons were formed in the SWCNTs bundles due to the self-decomposition of CH4. The temperature window of SWCNTs efficient growth is between 800 and 950 °C, and the optimum growth temperature is about 900 °C. These results were supported by transmission electron microscope images of samples formed under different temperatures. The temperature window is important for large-scale production of SWCNTs by catalytic chemical vapor deposition method. Since single-walled carbon nanotubes (SWCNTs) were discovered in 1993 , they have generated significant research activities due to their particular microstructures, unique properties and great potential applications in many fields. A single-walled nanotube can be described as a single layer of a graphite crystal that is rolled up into a seamless cylinder, with both ends capped with hemispheres made of hexagonal and pentagonal carbon rings. With remarkable properties, SWCNTs can be explored to be used in novel applications like pressure sensors, flow sensors and hydrogen storage [2–6]. Because SWCNTs possess so many unique properties, the synthesis of SWCNTs becomes a subject of a significant global research effort. Up to now, a number of methods for preparing SWCNTs have been reported, such as electric arc discharge , laser ablation methods  and catalytic chemical vapor deposition (CCVD) [9–13]. Among them, the CCVD method is becoming a dominant way for scaling up the production of SWCNTs at relatively low cost. In the CCVD method, methane, acetylene, hexane, alcohol and other hydrocarbons are used as carbon feedstock. The catalysts are generally supported on AI2O3 or MgO and consist of Fe, Co, Mi, Mo or mixtures of those metals. In the synthesis of SWCNTs by CCVD method, the temperature plays a key role. In this paper, we report the synthesis of SWCNTs by catalytic decomposition of methane over Mo2-Fe10/MgO catalyst and give a temperature window using Raman spectroscopy. With the relatively intensity of D band to the G band (ID/IG) and the transmission electron microscopy images of samples, we obtain that the optimum synthetic temperature is about 900 °C. A mixture of Mg(NO3)2·6H2O, ammonium molybdate, citric acid, H2O and Fe(NO3)2·9H2O at a weight ratio of 10:0.07m:4:1:0.16n (m = 2,n = 10, marked with Mo2-Fe10/MgO) was stirred for 6 h at 90 °C and dried at 150 °C overnight, then ground into a fine powder. Finally, the powder was calcined in air (air flow: 30 mL/min) for 30 min at 550 °C before used for SWCNTs growth. The growth of SWCNTs was carried out in a fluidized-bed which is shown in Fig. 1. 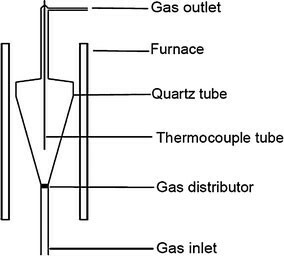 In a typical experiment, about 100 mg catalyst was put into the quartz tube. The temperature was raised to the setting value in Ar atmosphere at a flow rate of 200 mL/min before CH4was introduced into the reactor at 60 mL/min for 30 min, then CH4was turned off and the furnace was cooled to room temperature in an Ar flow. The impurities were removed by concentrate HCI. The Raman spectra were recorded by a Renishaw inVia spectrophotometer at room temperature and in a back-scattering geometry, with Ar laser at 514.5 nm. 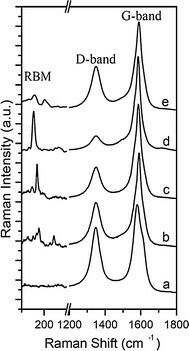 Figure 2shows the Raman spectra for materials grown at different growth temperature (a: 750 °C; b: 800 °C; c: 850 °C; d: 900 °C; e: 950 °C). In Fig. 2a, only the G band (tangential mode), D band (related to disordered graphite or amorphous) and a shoulder at 1604 cm−1(the fundamental E2gmode of graphite) are presented. In the lower wavenumber region (100–300 cm−1), the radial breath modes (RBM) which represent the existence of SWCNTs are hardly shown. The data show no SWCNTs are formed and there are only poorly multi-walled carbon nanotubes (MWCNTs) and organized carbon in the sample. The relatively high intensity of the D band relative to G band (ID/IG = 0.72) indicates mass amorphous carbon content or more defect concentration in the MWCNTs. When temperature increases to 800 °C, Raman spectrum of the sample (Fig. 2b) shows several weak RBM bands in the lower wavenumber region (100–300 cm−1). This revealed that SWCNTs formed at 800 °C. From the TEM image (Fig. 3a), we can observe that there are a few single SWCNT and SWCNTs bundle with different diameters. 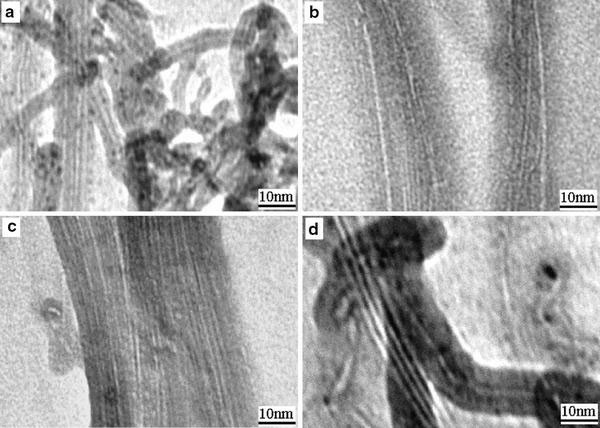 According to the equation ωRBM = 6.5 + 223.75/dt (cm−1) , the diameter of SWCNTs synthesized at 800 °C varies from 0.86 to 1.73 nm, which accords with the result of the TEM image (Fig. 3a). The intensity ratio, ID/IG, is observed to decrease with increasing temperature (at 800 °C, the ID/IG is 0.47). Raman spectrum of the sample grown at 850 °C (Fig. 2c) is typical for SWCNTs. In the lower wavenumber region (100–300 cm−1), two outstanding RBM bands are presented. According to the formula , the peaks at 147 and 169 cm−1 correspond to the SWCNTs with diameter of 1.59 and 1.38 nm, respectively. The TEM image (Fig. 3b) reveals that the product consists of single and bundle SWCNTs with even diameters. The intensity ratio becomes lower with ID/IG = 0.32 and the TEM shows that there are only a few amorphous carbons in the SWCNTs bundle. The RBM mode is observed as a strong band at 160 cm−1in the Raman spectrum at 900 °C (Fig. 2d). The relatively lower intensity,ID/IG = 0.14, indicates a lower amount of amorphous carbon content or a lower defect concentration in the SWCNTs. This can be observed from TEM image in Fig. 3c. As shown in Fig. 3c, the SWCNTs in the bundle have even diameters and appear clean and uncoated. It is well known that when the diameter distribution of SWCNTs is more narrow, the application values of SWCNTs are higher. At this growth temperature, only one strong band at 160 cm−1in the Raman spectrum, this shows the diameter distribution of SWCNTs is very narrow. All the results show high-quality SWCNTs have been synthesized at 900 °C. By increasing growth temperature to 950 °C, more amorphous carbons are formed in the SWCNTs bundles due to the self-decomposition of CH4. This is shown both in Raman spectra (Fig. 2e) and TEM images (Fig. 3d). The spectra show theID/IGincreasing rapidly with increasing growth temperature. The TEM images show that SWCNTs are coated by more and more amorphous carbons, and when the temperature increases to 950 °C, SWCNTs are hardly observed. In order to study the influence of growth temperature on the purity of prepared tube samples, we give the curve (Fig. 4) showing the dependence ofID/IGon the growth temperature. From Fig. 4, two kinds ofID/IGdistributions can clearly be distinguished. 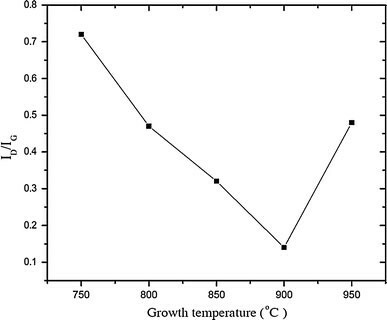 From 750 to 900 °C, theID/IGdecreases with increasing growth temperature. When the temperature is higher than 900 °C, theID/IGincreases with growth temperature. In the former stage, SWCNTs are formed gradually with increasing growth temperature and the content of SWCNTs in the products increases. In the latter stage, the high growth temperature causes CH4self-decomposition. With increasing growth temperature, more and more amorphous carbons are formed, and when the growth temperature increases to 950 °C, only a few SWCNTs are shown in the results and are coated by plenty of amorphous carbons. A temperature window of SWCNTs growth by catalytic chemical vapor deposition of CH4over Mo-Fe/MgO catalyst has been studied. The results suggest that when the temperature is lower than 750 °C, only a few SWCNTs are formed, and when the temperature is higher than 950 °C, more and more amorphous carbons are formed in the SWCNTs bundles due to the self-decomposition of CH4. The temperature window of SWCNTs efficiently growth is between 800 and 950 °C, and the optimum growth temperature is about 900 °C. The authors thank the support of Natural Science Foundation of Linyi, China.